The company has managed to make the major leap in output whilst maintaining lead times and is now looking to keep up with customer demand and a move into new international markets by ramping up production to 450 machines by the end of 2019. “I think the decision to invite PP Control & Automation to become a strategic outsourcing partner was a very significant moment for the relationship and kick-started a series of discussions that have transformed the way we build our robotic milking machines,” explained Andrew Dodwell, group managing director at Fullwood Packo. “We made the decision that we would be completely transparent with our growth plans and the manufacturing challenges we faced and gave our partner the opportunity to look at ways in which it could support our plans. 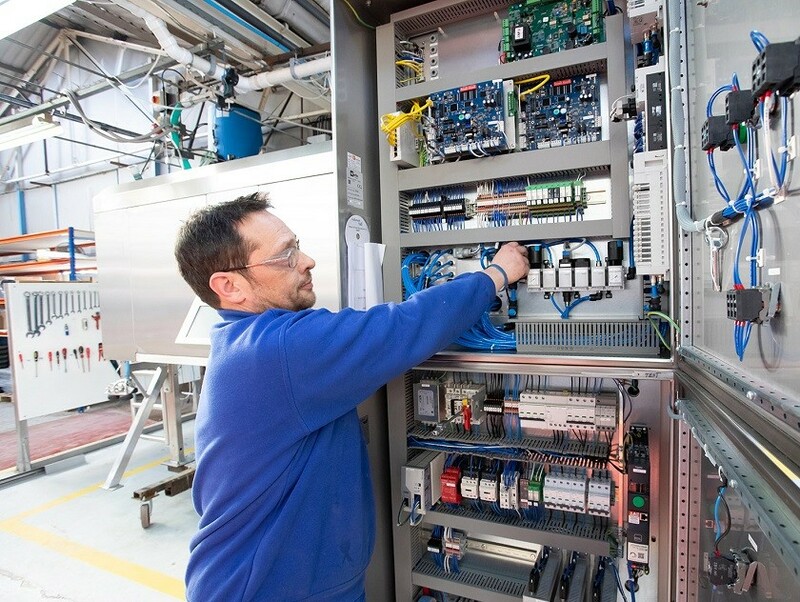 Following these initial discussions, a plan was agreed in April last year on how both the electrical and mechanical controls could be combined into a single integrated outsourcing approach for M²erlin. Work then commenced on both production engineering - identifying areas of standardisation, option configuration, combined test requirements - as well as mapping out supply chain needs and engaging both current and new suppliers to ensure optimum quality, reliability and total production costs. The supply chain challenge also required PP C&A to move fabrication and machined parts (historically manufactured by Fullwood Packo) into its supply chain, thus creating the additional capacity required for the planned growth. Tony Hague, CEO at PP Control & Automation, went on to add: “This is a great example of how a normal supplier/customer relationship has been transformed into a strategic partnership where both companies benefit from playing to their strengths. “We have successfully used our design and build experience to help eliminate production constraints from Fullwood Packo, leaving them free to concentrate on growing their business and scaling up without the challenge of physical space issues or availability of additional skilled labour. M2erlin was first introduced in 2014 and is recognised as the best performing milking robot, providing farmers with a robust system for voluntary milking cows. This is different to the traditional involuntary approach that sees them herded together in a parlour for example. Using the automated method, cows will present themselves when they are ready to feed and, using an electronic tag, will be identified and moved into position for the efficient laser-guided attachment to be fixed to the teats. M2erlin is developed around improving milk quality, increasing efficiency and maximising productivity, with each robot able to milk up to 70 cows in one day. Andrew Dodwell said: “The recent expansion is just the start. We have ambitious plans in place to increase domestic sales and increase market share in strategic international territories, including Australia, Canada, China, New Zealand, Russia and the United States.